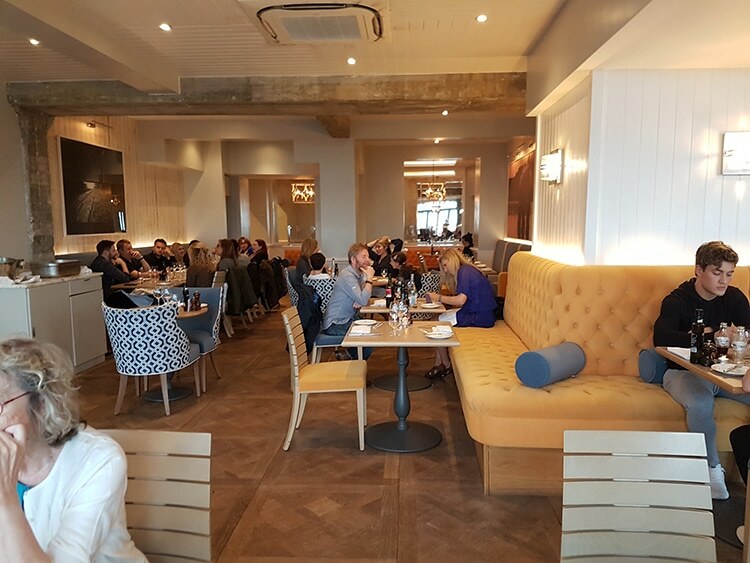 After successful restaurants in Christchurch, Dorset, Salcombe, Bristol, Guildford and Chichester, The Jetty restaurant opened in Brighton. 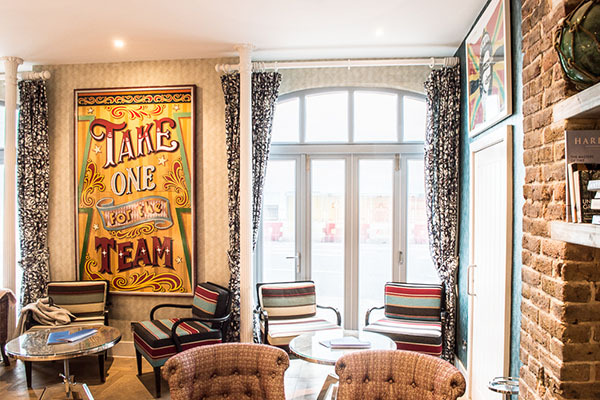 Situated on the ground floor of The Harbour Hotel on Brighton seafront, it’s a clean, extremely light and modern restaurant. There are many window seats offering panoramic views of the sea, and plenty of other seating options that could accommodate small or large parties. The white wash wood gives the space a nautical feel, which works well alongside The Jetty’s predominantly seafood menu. There is a lively atmosphere and the restaurant is busy even though it’s not yet 7pm on a Wednesday night. We are seated by a window by our waitress. She explains the menu competently and shortly after brings us bread and butter and a jug of water for the table. We can see the award winning, fully stocked, HarBAR from our seats. The drinks menu is extensive, with a wide selection of wines, by the bottle and the glass, along with some fantastic sounding cocktails. The barmen seem to be a dab hand at mixology, so my friend selects herself a ‘Gin Bouquet’ (£7.95). Even though I’ll be ordering fish, I go for a red wine. I pick something light and order a large glass of the Pinot Noir (£5.65). There are several elements to the menu. 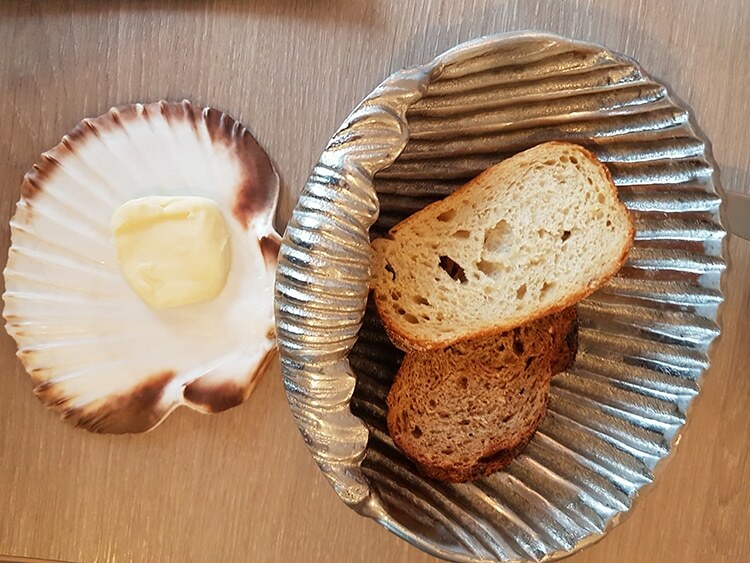 ‘Jetty Bites’ are suggested as little dishes to eat ‘while you choose’. These are a variety of different oyster dishes. There are also ‘Bites’, ‘Jetty Tacos’ and Tempura’, which can be ordered as small dishes at the bar or starters. Included are favourites such as ‘salt and pepper squid’, along with some more unusual contributions such as ‘cockle popcorn’. If you’re not a fan of seafood, The Jetty adds in some alternatives: ‘shredded crispy duck tacos’ and ‘chicken popcorn’ for meat eaters and ‘vegetable tempura’ for the vegetarians. The ‘Starters’ on the menu are more adventurous. ‘Twice baked cheese soufflé’, ‘quinoa, mango and pigeon’ and a ‘selection of sashimi’ are among those which tempt me. I go for the ‘octopus carpaccio’ (£8) in the end. The ‘Simple Seafood’ dishes can be ordered as starters or mains and cover all the classics. No seafood menu would be complete without ‘fish and chips’, ‘prawn cocktail’, ‘smoked salmon’ or ‘Moules Marinieres’. My friend orders her ‘south coast scallops’ (£3.50 each) from this section of the menu. 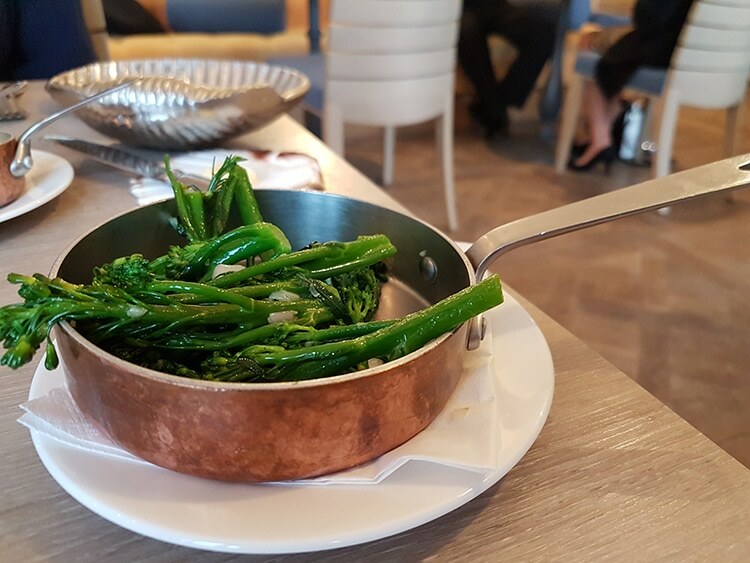 The main dishes are split into ‘Pasta/Risotto’, ‘Catch of the Day’, ‘Meat Dishes’ and ‘Classic Mains’. From this selection, those which stand out are simply named ‘miso marinated salmon’, ‘cod and crab’; and ‘chicken, prawn and lobster’. 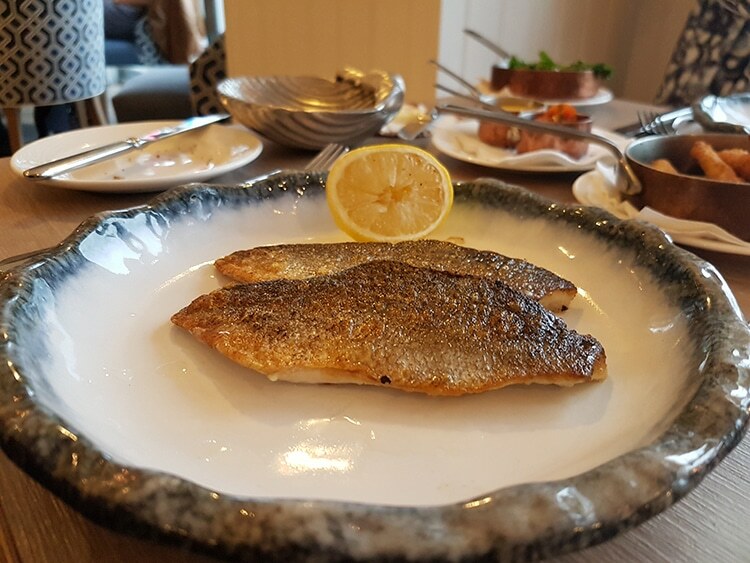 However, the no nonsense ‘Catch of the Day’ (£14.50) appeals to us both, so we order a filleted grilled Bass and on the recommendation of our waitress, the Lemon Sole, also filleted. 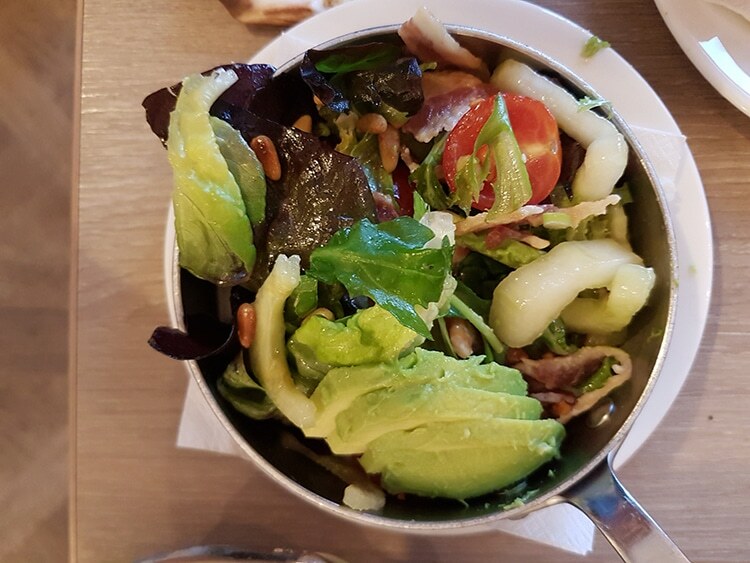 We order three sides to accompanying the fish. The starters are presented nicely. 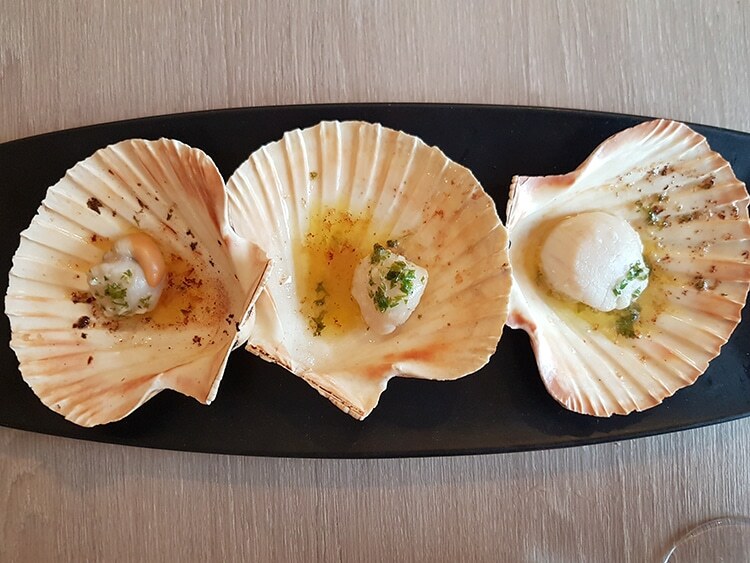 The scallops arrive in their shells, three in a row on a black slate. They look delicate and simple. 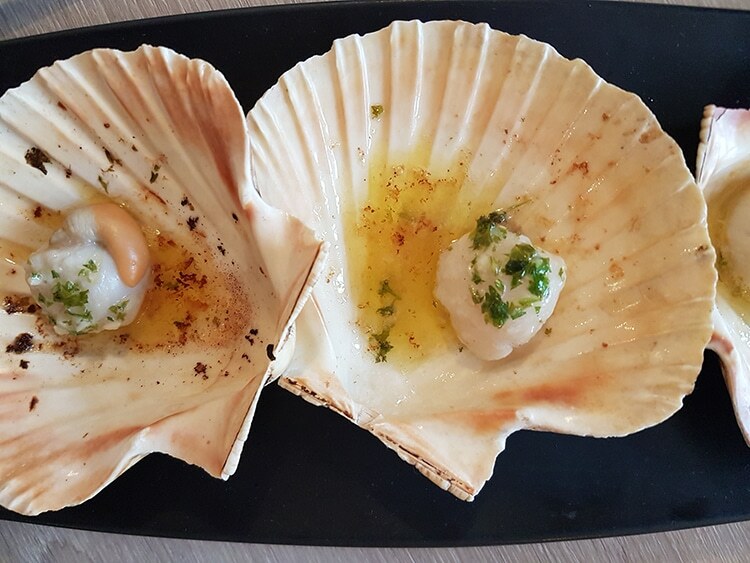 They are served in parsley and garlic butter and are cooked well. The butter is not over powering, and the scallops are tender. 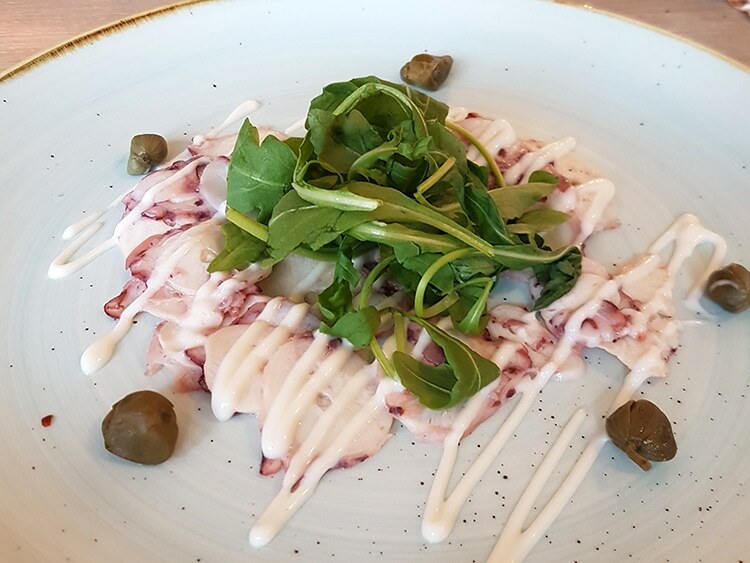 The octopus is slow cooked, sliced thinly and arranged around the plate with a rocket salad. It is drizzled in a mayonnaise dressing, that may have a hint of lemon and decorated with a few capers. 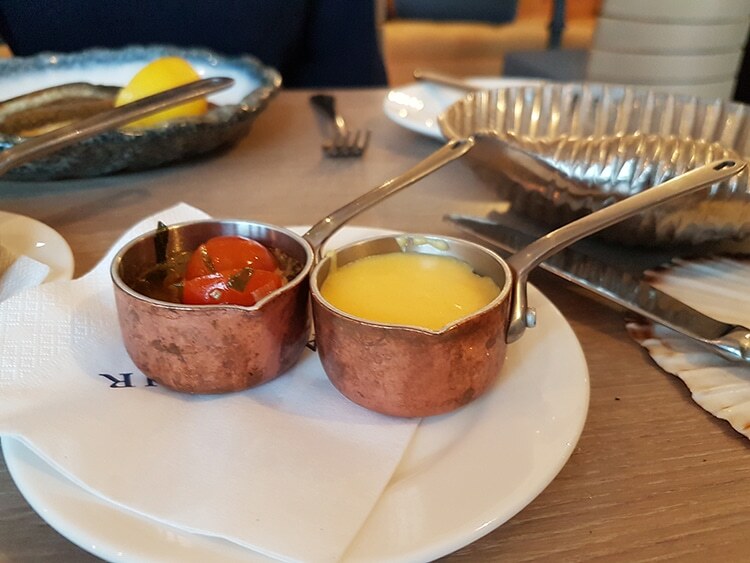 The menu had described the dressing as a lemon, chilli and chive dressing, so this was not what I had expected, but the dish was still very enjoyable. By the time we finish our starters the restaurant is buzzing. The waiting staff are feeling the strain; this number of diners seems to have been unexpected. 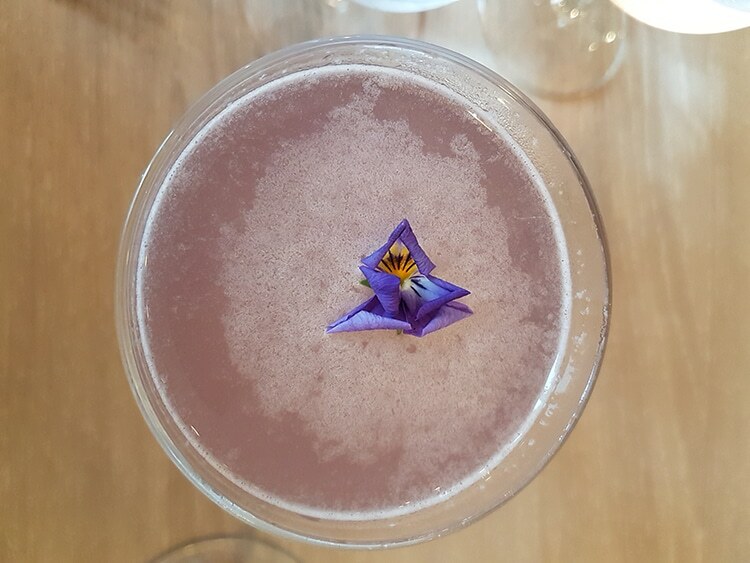 We are happy to break before our mains to enjoy our drinks and catch up; my friend’s beautiful cocktail is going down particularly well. When our mains arrive, they are presented modestly. My friend orders a large glass of the Sauvignon Blanc (£7.50) to accompany her fish and we tuck in. 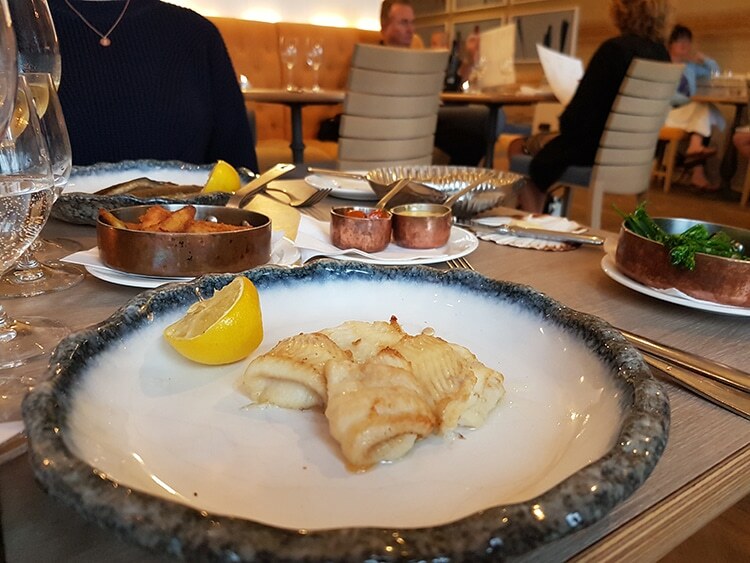 The fish is served alone, which makes the plate appear a little empty; however, our three ‘Sides’ are quick to follow. This is unpretentious seafood. It has not been dressed up, plated with just a slice of lemon as a garnish. Both fillets are cooked well. The Bass has a lovely crispy skin and has been seasoned just right. The Lemon Sole is meaty and flavourful, although, once filleted, gives less fish than the Bass. The sides: ‘greens’ (£3.50), ‘zucchini fries’ (£3.50) and ‘bacon and avocado salad’ (£4), all complement the fish. My personal favourite being the zucchini fries, which are an interesting twist on regular fries, crunchy, light and fluffy. The sauces round everything off nicely. We have opted for the classic ‘hollandaise’ and ‘Tomato, Olive Oil and Basil’ (both £2.50). We both feel satisfied, but not over full. 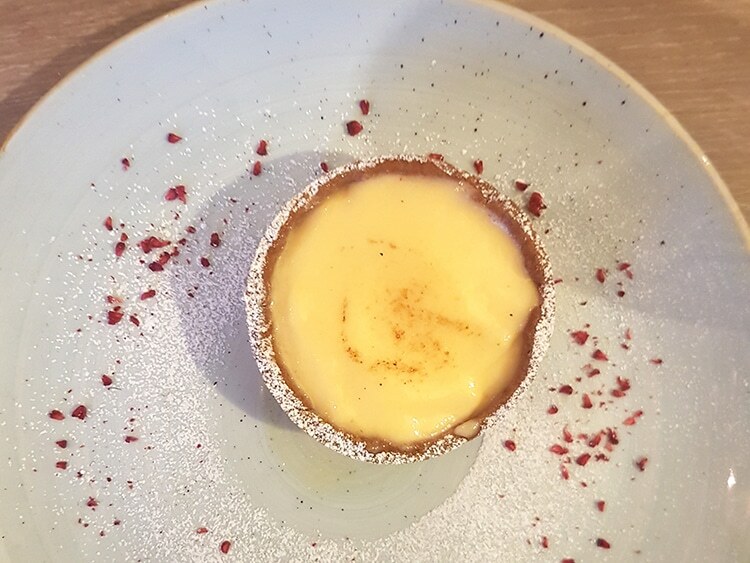 We agree to share a dessert and order the ‘simple lemon tart’ (£5.95). This is one of my favourite desserts; it’s always a refreshing way to end a meal. This tart has a rich and creamy lemon filling and although the pastry is a little over cooked, it does the trick, contrasting nicely with the smooth filling. To wrap it all up we are invited to the bar to watch the barmen work their magic. I am treated to a wonderful Mezcal invention with rosemary and my friend gets something with rum, which arrives decorated with sweet cherries. 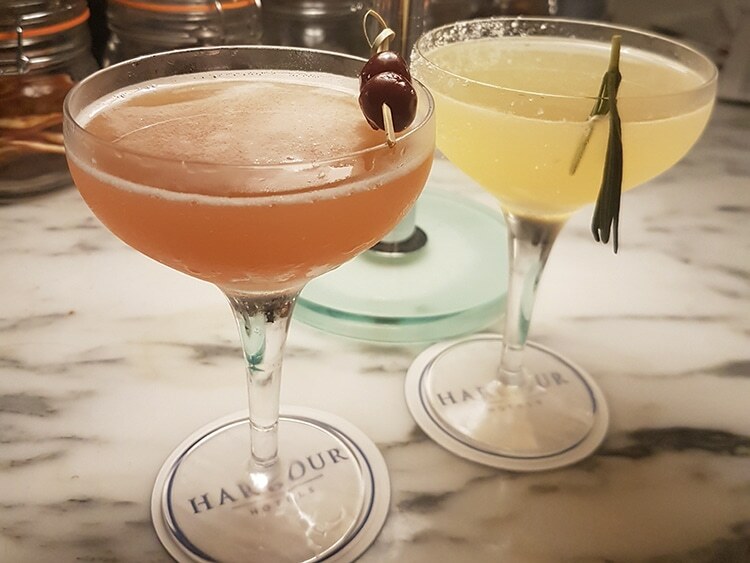 Both cocktails are delicious. We could’ve have happily stayed here all night. But all good things have to come to an end… and this night ended on a high!